The Great Puppy Invasion by Alastair Heim, illustrated by Kim Smith. Clarion Books, 2017. 9780544999176. Hundreds of puppies invade the town of Strictville, which has a history of ridiculous rules. The adults think it’s a catastrophe and treat it like a horror movie. The large-eyed puppies just want to play. The entire joke depends on the cuteness of the puppies, and it totally succeeds. Chuck and Woodchuck by Cece Bell. Candlewick Press, 2016. 9780763675240. Caroline’s classmate Chuck brings Woodchuck to school for show and tell. He’s so funny the teacher invites him to come to school every day. And he’s super friendly to Caroline, helping her with whatever she needs, probably because Chuck likes her so much. Bell’s graphic novel El Deafo is so good! Try that one, too, if you’ve never read it. 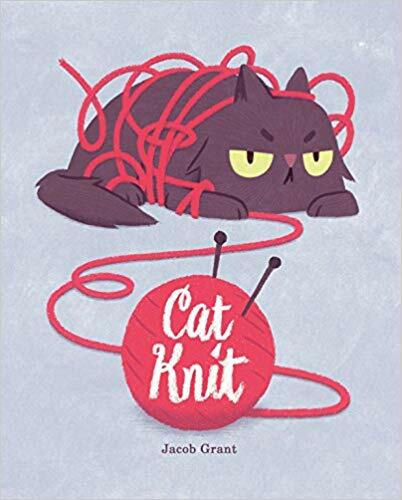 Cat Knit by Jacob Grant. Feiwel and Friends, 2016. 9781250051509. Cat loves his new friend Yarn, but when Yarn changes (and becomes an itchy sweater knit by Girl), Cat isn’t sure he still likes Yarn. Buy this for every knitter you know. Don’t Eat That! by Drew Sheneman. Viking / Penguin Young Readers, 2018. 9781101997291. A young girl scout out bird watching sees a brown bear about to eat a rock and screams at him. She decides to help him figure out what to eat to earn her Wildlife Buddy merit badge. But he can’t swim, has poor judgement, and even rabbits beat him up. Best moment: when he tries to chew on a tree with a very suspicious beaver. Sheneman is a syndicated cartoonist with several picture books to his credit. This one is formatted like a comic book throughout, and the drawings are hilarious.